I have merged numerous datasets that have the same attributes in different fields. I have TotalAcres, Total_Acres_Burned, TTL_ACRS, etc... I am trying to use field calculator to populate one field (TotalAcres) with all the acres values from the varying fields. Using ArcMap 10.4.1 and python as parser. Then my CodeBlock is: TotalAcres= !TotalAcres! It runs without throwing an error but it does not populate TotalAcres with the value from any of the other Acres fields. You need to use the return method to write the new data to the field. Not the answer you're looking for? Browse other questions tagged arcgis-desktop arcmap field-calculator python-parser or ask your own question. Using Python if/then/else to return value from either of two fields based on value of third using ArcGIS Field Calculator? Using Python parser of ArcGIS Field Calculator to populate values in one field based on those in another? 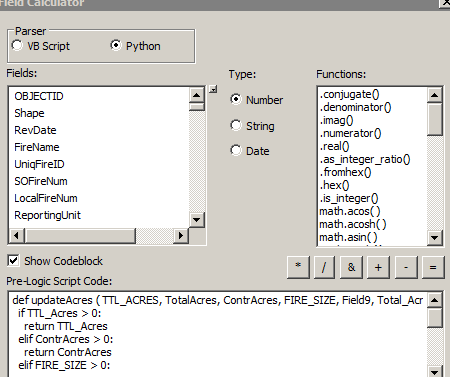 Python code in ArcGIS field calculator error? Using Simple Python Parser expression? Using ArcGIS field calculator with if else to populate field?